Let’s admit it; most jocks are boring when they talk about their professional exploits, but sneak a glimpse into their private lives outside athletics and the action heats up. Wrestler Mad Dog Vachon was one of the funniest athletes I ever interviewed among the many football, hockey , baseball and tennis players I had occasion to write about during my careers at "The Canadian Press" and at "United Press International." When I interviewed him for UPI in October 1986, Vachon had just retired from the ring to take up a new part-time career as a food critic for a French-language television station in Quebec City. What struck me about Vachon was his great sense of humour. Unlike his Mad Dog ring persona, he had a kind word for every passerby who stopped him for an autograph as I interviewed him at a McDonald’s restaurant near the Palais de Justice in Old Montreal. I’m sure it was that positive attitude which helped him to recover from a horrific incident the following year when a hit-and-run driver struck him on a dark country road near Omaha, Nebraska, resulting in the amputation of a leg. 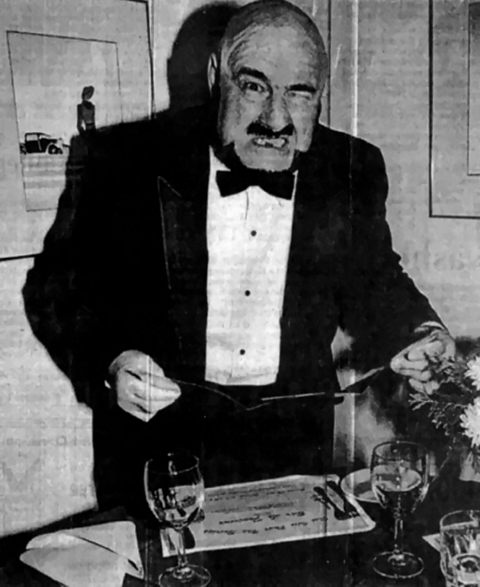 PHOTO:UPIDressed in a tuxedo, professional wrestler Maurice “Mad Dog” Vachon examines the menu of a Quebec City restaurant during taping of TV show on which he’s a food critic. MONTREAL — The five grayhaired ladies from South Carolina resembled piranhas in a feeding frenzy when they sighted wrestler Maurice "Mad Dog" Vachon munching a hamburger at a fast-food restaurant in Old Montreal. "I've seen him on TV," Mazella Caldwell cooed as she threw her arms around the granite-hard shoulders of her hero. "He's the best-looking one," she added, eyeing his cue-ball dome, splayed nose and cauliflower ears. The dean of big-time wrestlers flashed a gapped grin and wrapped his massive arms around each woman as the Instamatics flashed. "I like people," Mad Dog confided. "The only ones I don't like are the ones who want to fight with me." Mad Dog, 57, has been booed and cheered by fans from the sushi bars of Tokyo to the steel mills of Pittsburgh. He has fought 13,000 bouts in 40 countries over 44 years. After climbing out of the ring for the last time Oct. 13 at Montreal's Paul Sauve Arena, he was leaving behind the world of body slams and flying drop kicks for the more genteel vocations of gourmet food critic and open-line radio host. It's hard to imagine 5 foot 8 inches and 235 pounds of Mad Dog stuffed into a black tuxedo dining on such delicacies as soup Parisienne, creamed salmon with tarragon and duck a l'orange. But each week, more than 1 million viewers across Quebec turn on their TV sets to see Mad Dog, in his guise as Inspector Gourmet, give the thumbs up or down on the most exclusive eating establishments in Quebec City. His cement-mixer voice contributes to the incongruity. The first programs, taped in August, were a great success, says Jean-Marc Beaudoin, vice-president of production at Pathonic Communications Inc., which owns seven French-language Quebec TV stations that broadcast the programs. made eyes the first few shows. He turned things upside down. He has an extraordinary sense of humor." What does the Mad Dog know about fine food? "Anyone can be a food critic and everyone is," Mad Dog said in his heavy French accent as he demolished his hamburger. "I don't take the job (of food critic) too seriously. I have fun, but I never thought it would come down to my wearing a tux and a bow tie. I don't like that part of it." The food isn't always that great either. "I ate some duck you could have left in the water," he said. "Another time they gave me shark. It was so bad I had to leave it. It's a mad dog fish." His new careers will extend into radio. CHOI-FM in Quebec City has hired him to give his views on any and all subjects — from the world of politics to sports — on its competitive open-line morning show. Mad Dog isn't shy about taking a stand. "They (the radio station) needed dynamite and they're going to get it." he said with a grin. Some in the glitzy world of wrestling heaved a sigh of relief when the former world champion announced that he was retiring. Paul Leduc, another Quebec-born wrestler, fought Vachon more than 1,500 times over 22 years before he retired from the ring 10 years ago. "Many wrestlers didn't want to go into the ring with Mad Dog," Leduc recalled in an interview. "He'd get excited when the crowd booed him. When he threw a kick or hit you, he wanted to show the crowd that you felt it. He was dangerous." If the crowd baited him, Mad Dog would wade in, legs lashing and fists flashing. He was sued several times by fans injured trying to mix it up with him. "Eight times out of 10, we'd have a riot with the Mad Dog," Leduc recalled. Vachon was smaller than many of the monsters he wrestled, but he had technique and a bad temper. As an amateur, he won a gold medal at the Commonwealth Games in New Zealand in 1950. After working as a bouncer at some of Montreal's meanest nightclubs in the late '40s and early '50s, Vachon took his tough-guy act into the professional ring where he won 90 percent of his bouts. The American Wrestling Association recognized Vachon as world champion for three years, beginning in 1964. He evolved over the years into the villain the fans loved to hate. Vachon was tagged with the name Mad Dog during a bout in Portland, Ore. 24 years ago. Before the bell rang, he attacked his opponent and threw him out of the ring. Vachon says he will miss the "glamour and excitement" of the ring, but not the injuries. He has broken his collarbone 10 times and his ankles twice. He has broken both arms and has suffered painful neck and back injuries. Unlike many ex-wrestlers, Mad Dog doesn't plan to fade away. His roles as food critic and radio commentator are just the first of many new ventures he has planned, including a film career and, perhaps, a political one. He is a familiar face in Canadian beer commercials and has already cut a record — "The Mad Dog Rap."